If I could eat only one type of Japanese cuisine for the rest of my (hopefully long) life, it would be yakiniku (焼肉). Originating from Korea and popularized in Japan during the 19th century, its literal translation is “grilled meat.” Those two words sum up everything you need to know, so vegans can stop reading now. Thousands of yakiniku restaurants are scattered around Japan, from the tropical islands of Okinawa up to the snowy tip of Hokkaido. Customers gather around tables equipped with sunken grills heated by gas-fueled carbonized coals. You choose your set menu, sling in a few vegetables or noodles in a futile attempt to feel less carnivorous, and then grill away to your heart’s content. You are the chef. Simple. Let me state for the record that Japanese beef has no equal. Nothing I have eaten outside Japan approaches the same quality. The thinly sliced beef is so melt-in-your-mouth tender and flavorsome that you might assume it comes from a different animal altogether, one that roams around some idyllic pasture in heaven. Allow me to explain why. You have probably seen wagyu (和牛肉) on many menus. It translates as “Japanese cow,” which doesn’t sound quite as tasty. Wagyu comes from four breeds of cattle: Japanese Black (which comprises 90% of the bovine population), Japanese Brown, Japanese Polled and Japanese Shorthorn. High fat content gives wagyu its famous and distinctive marbling, and it’s the result of centuries of breeding cattle to toil through rice paddies (picture those poor Japanese cows struggling to extricate hooves from glutinous terrain while their Occidental cousins mooch about blissfully chewing the cud). Generations of working under demanding conditions increased the animals’ intermuscular fat cells so that Japan unwittingly bred the most delicious beef known to humankind. Gustatory virtues apart, wagyu is healthier in terms of both its monounsaturated-to-saturated fat ratio and also the kind of fat it contains, which is higher in omega-3 and omega-6 fatty acids and has less effect on cholesterol levels. Yukhoe, pictured here, is usually eaten raw. Each region, or prefecture, has tended to isolate its own strain of cattle, but Kobe is the best-known – and the most misappropriated. It has become a generic term to inveigle customers into paying more for ordinary beef. In any case, the best wagyu arguably comes from further south, around Miyazaki, since this prefecture tends to perform better in domestic competitions. And while we’re here, disabuse yourself of the notion that across Japan’s countryside, farmers massage their cattle more than wine critics massage their scores. Mollycoddled cows suckled on the finest beer or saké? No doubt a tiny handful of caring farmers have given the odd shoulder rub to relieve stress, but really the pampering is a myth, which probably is why The Times rehashed this fallacy the weekend before I filed this piece. The Japanese have an alphanumerical system to classify quality of wagyu, the highest being A5 and the lowest C3, though it is rarely mentioned on a menu unless it is A5. The letter refers to the yield grade – basically the proportion of meat obtained from that part of the cow, “A” being the highest. The number signifies the level from one to a maximum five in terms of marbling known as sashi, the brightness/color texture and the quality of fat. To rate an A5, the meat must score a five in all categories, otherwise it is downgraded to four or even lower. You may well have eaten wagyu outside Japan, from herds in Australia, the US and the UK. However, it is not the same as domestic Japanese wagyu because hardly any non-Japanese herds are purebred. Since government export bans were lifted in 1997, you can import a couple of Japanese bulls, allow them to have their wicked way with your herd and then baptize all the calves “Wagyu.” It is slightly deceiving but legal, ergo the proliferation of Kobe burgers. Scrupulous breeders will be selective so that their meat has some verisimilitude to genuine wagyu; however, in my experience, there is always a tangible difference, not so much in flavor, but rather in texture and hardness of fat, and most definitely umami. Wagyu is huge business because of worldwide demand and the premium it commands overseas. Testifying to how far some people will go to obtain wagyu, the aforementioned Times article concerned a Japanese man illegally smuggling a container of fertilized wagyu eggs into Shanghai. He was caught, but many must make it through undetected. 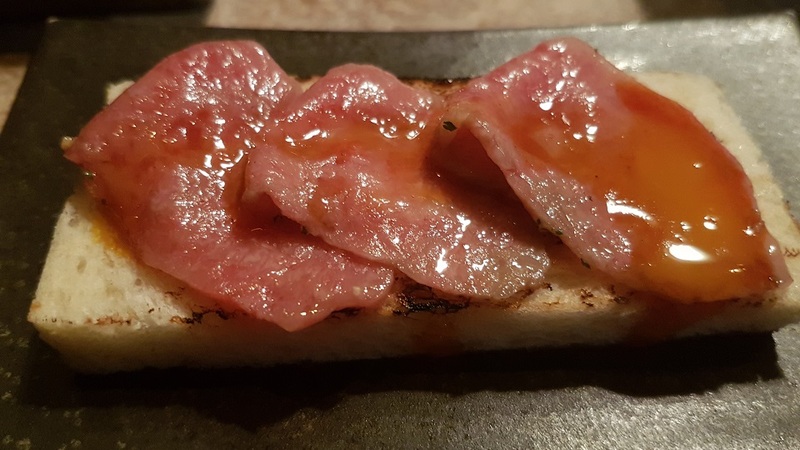 Beef loin served on bread. Even the bread is utterly delicious. So, you have traveled far to reach magical Japan. Given everything I have written so far, should you demand the finest A5 wagyu? In my experience, unlike sushi or sashimi restaurants, you can dine at some of Tokyo’s best yakiniku restaurants without the eye-watering prices demanded by celebrity sushi chefs glowering from behind their counter during a 19-course meal suffered in holy silence. Even at entry-level yakiniku restaurants, I find that the quality of wagyu starts at a high base, simply because so much Japanese beef totally rocks, notwithstanding that yakiniku obviates the need for a skilled chef; there is no feckless trainee turning your sirloin into ash in the kitchen. You can pay less if you wish. Personally, I find a sweet spot at around ¥8,000 to ¥12,000 per person (between $70 and $110) for a multi-course set meal where your taste buds will confirm that you are experiencing well-bred wagyu without selling your priceless Pokémon card to pay the bill. 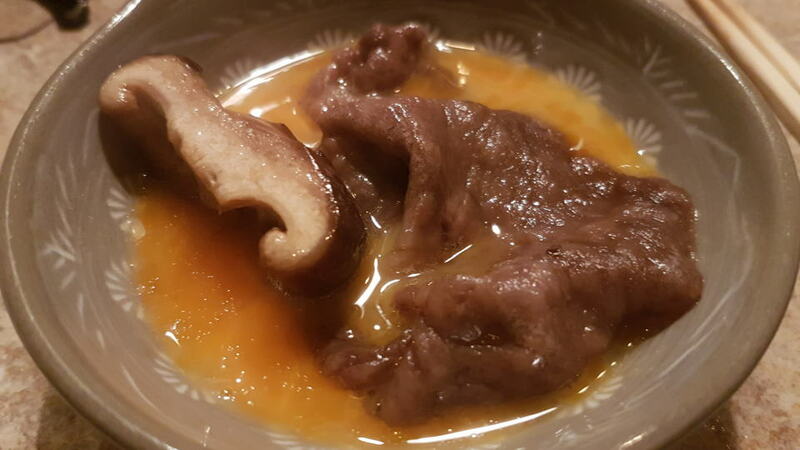 There are different ways of cooking the meat – for example, boiled, as in shabu shabu (しゃぶしゃぶ), or in sukiyaki (すき焼き), where it is part of a stew. In my opinion, yakiniku is the purest form, though menus like the one I chose at Cobau incorporate both shabu shabu and sukiyaki. On Vinous Table, I will introduce two yakiniku restaurants from the vast ocean of thousands. 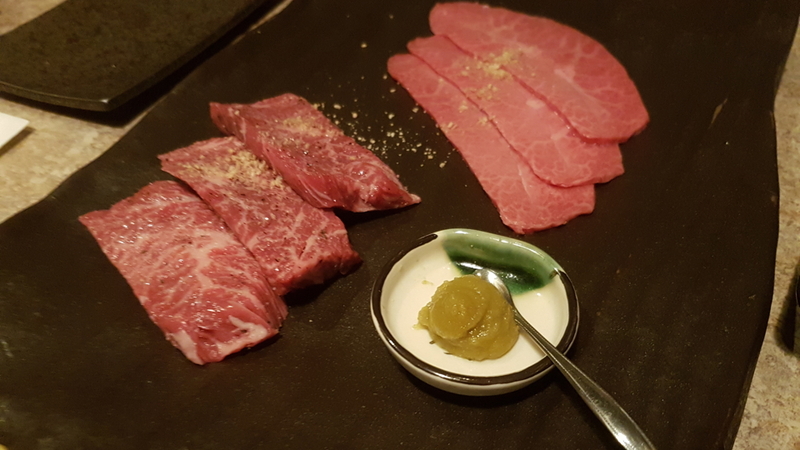 Of the two, Cobau Ginza, the subject of this article, is more straightforward in style and one of the few accepting corkage, while Yakiniku Futugo shows more culinary flair. Cobau is my go-to yakiniku restaurant in Ginza. Restaurants in this salubrious part of Tokyo can be jaw-droppingly expensive, but Cobau is reasonably priced for its quality. Like many Tokyo restaurants, it is almost impossible to locate, since this metropolis gets by without street names, and innumerable establishments are hidden up on the nth floor of nondescript buildings. Plan ahead to get your bearings according to Ginza’s retailers and work out the correct block first - finding it is part of the fun. Kuri and togarashi cuts, left and right, respectively. Cobau is a basic-looking restaurant with separate rooms for individual parties, each with a buzzer to call your young server. This is Japan and therefore service will be impeccable. We opted for the mid-price set menu at ¥8,500 per person, though you can spend more for additional courses. I am not going to break down the anatomy of every dish because there is no point. You are basically on a gustatory tour of a cow, although I find it best to interpolate courses with non-beef dishes. We freshened our palates with starters of kimchi and pickled cucumber and opted for some stunning king prawns. The first course was eaten raw. Yukhoe is basically Korean steak tartare seasoned with black pepper and sesame. It is sometimes served with egg yolk, although here it was just dipped in a light soy sauce. The exceptional beef loin was served on bread with egg yolk. Cobau Sukiyaki with shiitake mushrooms, tofu served with raw egg. Kuri is a lean cut from between the shoulder and the upper part of the foreleg, usually a little tougher than togarashi. It features particularly intense umami, so we were advised to cook it rare. Togarashi is a rare cut of beef taken from near the shoulder blades, above the front legs. It is named after a chili pepper (because the shape of the cut can look similar) and renowned for its juiciness and intense umami. As I mentioned, I chose this set menu because it included shabu shabu and sukiyaki courses. The waiter simply reorganized the table so that the grill was replaced by boiling water. 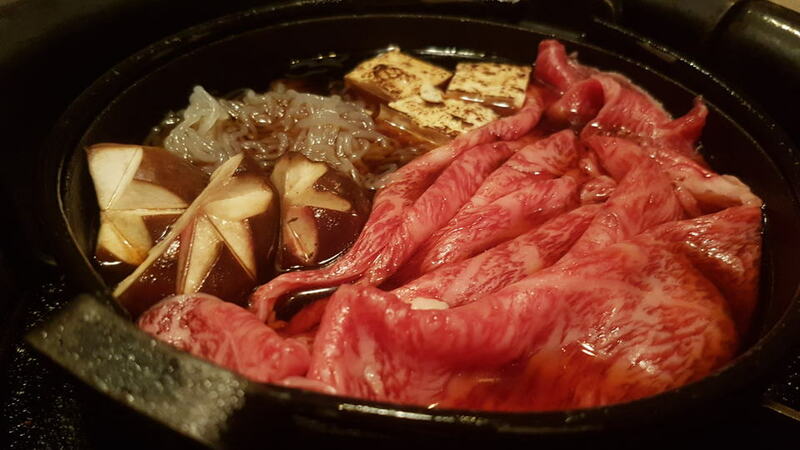 The sukiyaki, pictured below, was served the traditional way, with tofu and shiitake mushrooms, and was an absolute joy. After it was cooked, the meat was again dipped in egg yolk. The shortcoming of many yakiniku restaurants is the tendency of their wine lists to be brief, conservative and expensive. Cobau has a decent array of Bordeaux, including one or two First Growths. Fortunately, they accept corkage, but out of courtesy I ordered a bottle from the list. The 2016 Riesling from Dopff au Moulin is a satisfying entry-level Alsace from this well-known producer. It delivers refreshing pineapple and lemon curd on a nose that is not too blowsy; the palate is clean and fresh, offering ample passion fruit and grapefruit notes, and lightly honeyed on the finish. A well-made quaffing Riesling – commercial, but sound. 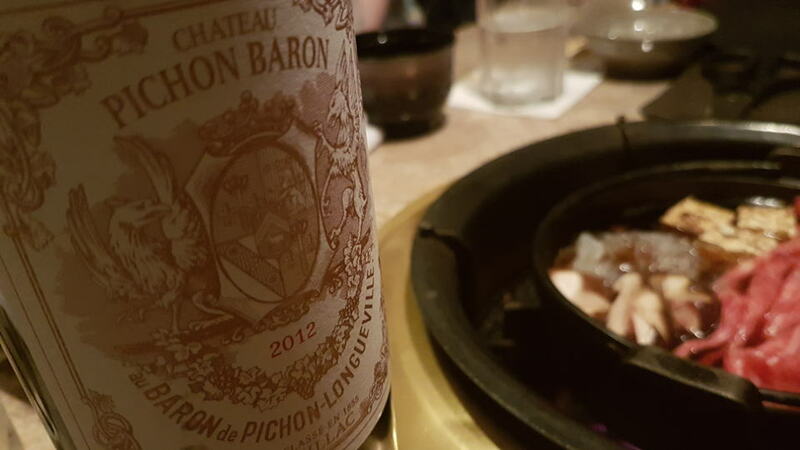 The 2012 Pichon Baron is a magnificent wine that exudes freshness on the nose, with razor-sharp graphite notes suffusing the black fruit. The structured, linear palate just “sings” Pauillac; it is not as bold or as ambitious as the 2009 or 2015, yet there is perfect dryness toward the finish that urges you to take another sip. Granted, it is far too soon to broach this wine – I just couldn’t help myself. The 1985 Vieux Château Certan is perhaps nearing the end of its drinking plateau. The mellow, loam-scented nose is a little loose-knit, and perhaps it can be seen as a lesser version of the 1989. I want more intensity, but make do with gravel and dried blood aromas that develop with aeration. This is not a deep or powerful Pomerol, but it conveys a sense of warmth, with a hint of black truffle on the finish and melted tannins. The 1985 is perfect to drink now, I would not be inclined to keep it too much longer. I hope this Vinous Table has enlightened readers about yakiniku and wagyu. 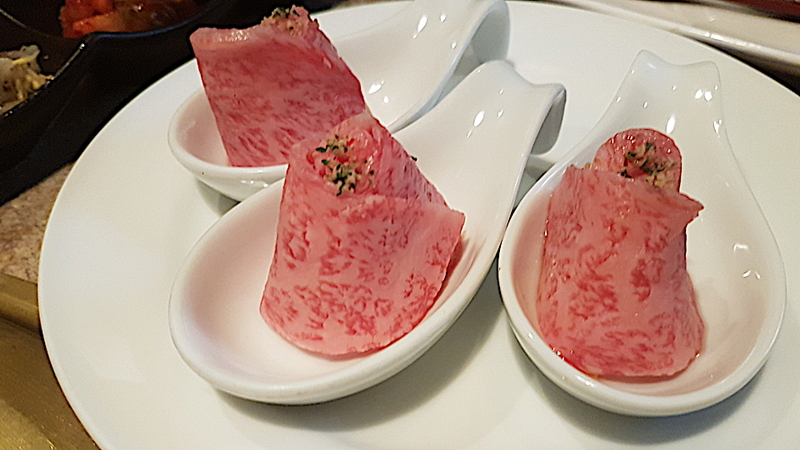 In a companion piece, I visit another yakiniku restaurant, this one with a bit more theatre.